Stylish one-piece phone designed by Ericsson in Sweden. They later bought North Electric in Ohio and made them in the USA as well. Available in a variety of colors, such as red, green, sandalwood, beige, pink and white. Price varies by color and condition: $80-200 . Email for current selection. Follow-on model introduced in Ericsson's centennial year. Pulse dial. Very limited production and rarely seen in the US. Available in brown, white and green. Email for details. 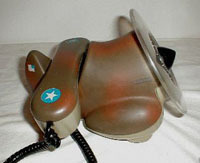 The dial is in the "propeller" area, the handset is the wing. Occasionally available in white or camouflage colors. TeleConcepts. 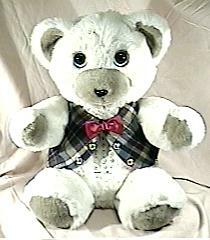 Buttons are on the bear's tummy. About 15" tall. Made of quality components in the '70s and '80s. When a signal is received, the bear's mouth and eyes move. 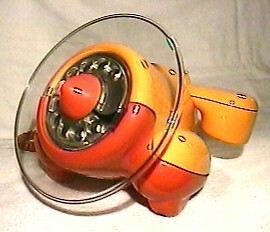 I was using one when Uncle Wilbur called. He still thinks I was laughing at his jokes. Requires 4 D cells or transformer (not included). May have plaid or red vest, depending on available stock. Only one left -- email for condition and price. Shipping available to Graham Norton fans (and others) worldwide. Snoopy and Woodstock on a simulated wood base. 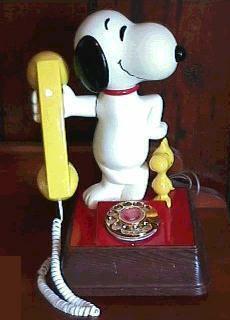 Snoopy's head can be rotated to face front or side. Available in TouchTone. Made in the '70s and '80s with high quality Western Electric or GTE internal components. Winnie the Pooh with butterfly and lamp ( $200). ©2001-17, Recollections. All rights reserved.